What is required in a VCDX submission? Next week we will have John Arrasjid and Mark Gabryjelski continuing the delivery of additional infrastructure architecture design advice and recommendations from a recent presentation John delivered at the Singapore vForum where he stated all three sessions of the presentation were full. Also a special shout out and thanks to Rene van Den Bedem aka VCDX133 for co-hosting with me and supplying so many questions as well as answers on the VCDX Panel session. 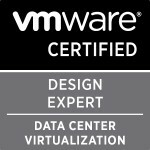 Go check out his VCDX series of postings if you want some of the best VCDX material available. Categories: Certifications, EMEA vBrownbag, vBrownbag, VCAP, VCDX, Virtualisation, VMware | Tags: Architecture, vBrownbag, VCAP, VCDX, Virtualisation, virtualization, VMware | Permalink.